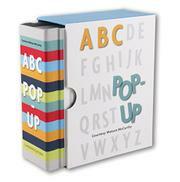 A small alphabet of pop-up shapes, tidily packaged in a slipcase. Alternating white forms on monochrome backgrounds with monochrome on white, the pop-ups—from a 3-D Apple to raised Yellow sweater with (nonworking) Zipper—accurately depict common items or scenes. For the most part, anyway—there are occasional inventive flights, as in an emphatically negatory concatenation of variously sized “NO”s representing those two letters. A few models feature moving parts, but in general McCarthy goes less for dazzling paper-engineering effects than for clean lines and neat compositions. Aside from an embossed, uncolored, single initial placed in an inconspicuous (sometimes nearly invisible) spot on each example, there are no identifiers or captions. This leads to opportunities for conversation. While the white Elephant is quite obvious, on the following page, three purple Flowers pop up over some blades of Grass—or maybe it’s a Garden? The large picture of a slice of orange on the carton of Juice will confuse more than one young reader. But most of the forms are probably too fragile for alphabet-learners anyway.